Home Case Studies Madison R.
First Entry: January 24, 2009: Madison was born in June 2002 and I adopted him from a shelter shortly thereafter, which is where our adventure together begins. His history is uncertain, as he was bottle-fed as a kitten at the shelter. He was healthy as could be until early spring of 2007 when I began to notice his stool had become quite soft and became increasingly worse throughout the spring and early summer. I inquired about it during his annual trip to the vet in August and he still had not improved by November, so his vet at the time prescribed Science Diet Z/D canned and dry. He was only given one can and he didn’t like it much at all, so he mainly ate dry. Prior to this, he’d always been on dry food, mainly Science Diet. On this trip to the vet, he also received a dose of Panacur and a 30-day supply of Forti Flora. There was no improvement by January so I brought him back to the vet where he was given a dose of metronidazole and a Depo-Medrol injection. The vet recommended trying Purina Pro Plan Sensitive Stomach dry food, which I did. She also said that if he did not improve after this, there was nothing more she could do at her office. Madison’s weight was at his all-time high, 14.7 pounds, but he wasn’t doing well. This particular vet had been our family vet for years and has always been wonderful, but it’s a small-town vet with limited resources. She recommended taking him to the University of Wisconsin vet in Madison for intestinal biopsies, but said it was a risky and expensive procedure. I’d never owned a cat before and didn’t know that dry food isn’t good for them or about all the other options that were available. I had no idea what IBD was at this point. 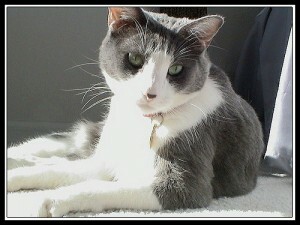 I had recently moved, so in February 2008, I took him to a different vet in a larger city in Minnesota. He’d dropped over a pound and a half in less than a month and was now at 13.12 lbs. The Purina Pro Plan Sensitive Stomach Lamb formula had shown a very brief glimmer of improvement, but no more. Madison was very gassy and had liquid stool every single day. To my surprise, this vet didn’t really say much about the possibilities of IBD either; in fact, I don’t recall them even mentioning it. Madison was not vomiting on a regular basis, but I would have thought the every-day diarrhea would get more of a reaction from a vet. Instead, they were concerned with the dire state of a couple of his teeth, which he needed to have removed. It was an expensive surgery, and it did nothing for his weight. By the first week of March, he was down another pound to 12.3. I kept giving him the Purina Pro Plan Sensitive Stomach formula, praying it would somehow work. I figured since after two vets, with the most recent not really suggesting any further course of action, that there was nothing I could do. That’s when I really started to do research on my own and learned about IBD. Madison’s symptoms fit to a T. I became increasingly worried as more time when by and nothing was making Madison better. His attitude never changed throughout all of this. He is a highly intelligent and dignified fellow, and was such a trooper. I could tell he was starting to feel embarrassed, with the way he would sometimes sprint out of the litter box after a particularly explosive bout of diarrhea…as if he got out of there fast enough, no one would suspect it was him who made the terrible mess. I found the IBD support group on Yahoo groups, along with other websites, and read about foods that people have had some success with, and the idea of trying new sources of protein. I tried Natural Balance dry Duck and Pea, and the canned varieties in Duck and Pea as well as Venison and Pea. No luck with any of them. Madison’s gas was horrific by this point. I would never have imagined that a cat could fart that loudly, but he did, often waking me up in the middle of the night with his noise. He was going to the bathroom several times a day and showed visible signs of discomfort with cramps. It was breaking my heart to see him like this. I had moved early in the summer (which I’m sure did nothing but make him worse) and I found a vet who probably saved Madison’s life. His appointment was in October. I explained his symptoms and she immediately began telling me about IBD and what has worked for other cats with IBD that she’s treated. Since I’d been doing my research, I sort of knew what she was talking about, and together, we came up with a course of action. She started with an intestinal parasite test, a full CBC blood profile, and a thyroid/T4 test. Everything came back normal. Madison’s weight was at 12.5 lbs. and in the past few months he had not gotten worse, but the new foods had not made him better either. His vet was reluctant to start him on any treatments, such as steroids, until she had a definitive diagnosis. She told me about the options for ultrasound and exploratory surgery. She was heavily leaning towards surgery, explaining she feels it gives the best picture of what is happening, seeing things that an ultrasound or endoscopy can miss. I was worried about such an invasive surgery and wanted to try a couple of other things first. She sent a blood sample to TAMU and again, everything came back in the normal range. She put him on a trial of metronidazole for 10 days, which was a nightmare to give to him. He is nearly impossible to medicate and more liquid ended up in his fur and on my legs than in his mouth. We also tried Tylan Powder, but nothing in the world can cover up the vile taste of that stuff, so no luck there either. At the beginning of November, Madison was at 12 pounds. I’d switched him to Wellness canned Turkey and he was still not worse and not better. We were at a standstill and I opted to go ahead with the exploratory surgery. He had his surgery on November 14. I took him home that night because the vet was worried he would not eat if left overnight at the hospital. I was able to get him to eat, but in the middle of the night and again early in the morning he vomited. I brought him back to the vet in the morning and it seemed he had a negative reaction to one of the pain meds he was on. I didn’t give him that one again and he was fine. I kept him confined to an empty bedroom for 10 days while he healed, which he did quite nicely. The results of the biopsies were somewhat inconclusive, but did show signs of mild to moderate IBD. There were some abnormalities, but nothing that suggested anything conclusive. There was no visible scarring of the intestines, which surprised me, given the frequency and force of his diarrhea. Now we just needed to figure out what to do about it, because the canned food wasn’t doing the trick. A couple of days before Thanksgiving 2008, Madison’s vet called to see how I’d feel about giving raw food a try. She wanted to try this one last thing before putting him on steroids and she’d consulted with another vet who has seen great success with IBD cats and raw diets. Of course, I was ecstatic that I’d found a vet who was unafraid of raw. She suggested Nature’s Variety Chicken, so that’s what I got. It took some time for Madison to warm up to the idea and for the first couple of weeks I was mixing his canned Wellness turkey with the raw food. He eats Natures Variety Frozen chicken medallions, 4 medallions per day. He gets 2 in the morning, 1 in the afternoon, and 1 at bedtime. From day 1, even mixed with the canned, I saw a DRAMATIC improvement in his stool. For the first time in almost 2 years, Madison had normal looking stool! The vet originally suggested microwaving the frozen medallions for 30 seconds to kill any bacteria, but Madison HATED that. The texture was not to his liking. As soon as it becomes the texture of cooked ground beef, he will not touch it. I tried all sorts of combinations or microwaving frozen medallions and thawing then microwaving. The magic formula ended up being to thaw the medallions overnight, then microwave for 5 seconds before serving. If I happen to forget to put some in the refrigerator to thaw, I put a frozen medallion in the microwave on defrost for 30 seconds. He still gets 2 for breakfast, 1 in the afternoon, and another at bedtime. Each medallion is 1 oz, at 65 calories each. He has not had diarrhea since he started on raw the first week of December 2008. He used to go to the bathroom several times a day, always after eating, leaving a terrible mess. Now he goes one time per day, solid, small stools. Once I found the right way to prepare the food, Madison LOVED it. But then during the 3rd week of January, he got picky. One afternoon, I was feeding the cats, and I always give my other cat Talon a canned treat in the afternoon when Madison eats. I normally feed Talon Wellness Chicken or Turkey, but was out on this particular day. I had a can of grain-free Fancy Feast in the cupboard and gave Talon a little of that. Well, it must smell like heaven to a cat, because Madison immediately wanted some of what his brother had instead of what he had. Madison looked at his plate of raw, sniffed it, and just sat to watch Talon eat. He still had not forgotten, nearly 2 weeks later. He had to check out what Talon had and just sniffed his own food. He still finished his own, but I had to coax him with a half teaspoon of Wellness Chicken or Chicken baby food. He’s too smart for his own good sometimes. The other possible cause of his pickiness may have been due to needing to buy the Organic Chicken variety that month, because the only store in the area was out of regular chicken. I went to a different store and bought the regular chicken again, and he immediately went back to quickly devouring his food, licking the plate clean. I guess he’s not a fan of organic. During Madison’s last vet visit in November, he was at 12 lbs. From what I can tell weighing him at home, he’s hovering around 11 now. He lost some mass after his surgery and he’s a very active cat, so it’s been tough to put the weight back on. He does feel thin to me, but the vet said his ideal weight is right around 12 lbs. He had always felt very muscular to me, and I think that’s some of what he’s lost. He also lost a little bit of weight during his picky phase the past few weeks, so I’ve been giving him 5 medallions a day this week to boost his weight a little. I’m just so thankful to have found a vet who was willing to try whatever we needed to do to make him better. Raw food was the miracle cure for Madison and I pray that it continues to be. Madison is finishing up his last packets of Forti Flora this week, which he’s had sprinkled on his food for the past 2 months, but once it is gone next week, he’ll be completely free of any supplements or drugs. I think Madison is one of the lucky ones, who’s IBD can be controlled through moderating his diet alone. It’s not for everyone, and it takes some getting used to for the cat. Price-wise, I’ve found it to be similar to what I had been paying for canned, and as long as you can find a store near you that sells it, it isn’t any more difficult to find or feed. As more veterinarians begin to track the success of raw diets for IBD cats, I believe it will become a more widely accepted option. I don’t know if it was one particular ingredient that sets his IBD off, but I think we’ll be sticking with the Nature’s Variety Raw Chicken Medallions for a while! March 9, 2009: Madison finished off his Forti Flora packets during the first week of February and continues to be symptom free. He is not on any medication at all and is not taking any supplements. He has not had a single episode of diarrhea since transitioning completely to raw in December. I continue to feed him 4 Nature’s Variety chicken medallions per day and he has a wonderful appetite. His weight is holding steady at just under 12 pounds and he’s happy as could be. Madison was never a cuddly lap cat, but since he’s gotten better, he has become a great cuddler. I think his former gas problems must have make it uncomfortable for him to lay on anyone’s lap for longer than a few minutes. And now I can’t sit on the couch for more than 5 minutes without Madison hopping up! Maybe it’s just his way of saying thank you for making him feel so much better. July 24, 2009: It seems that raw food was not the “miracle cure” I had been hoping for. This spring, Madison started to throw up periodically, about once a week or every other week. Each time, the vomit consisted of a hairball, bits of food (mostly what looked like bone fragments from the raw food), and yellowish bile. He was still producing solid stool and hadn’t had a bout of diarrhea since he started on Nature’s Variety raw chicken back in December. However, in the beginning of July, the frequency of Madison’s vomiting increased to twice a week and then during the week of July 12 he began to throw up his food after eating in the morning. I began giving him 1/4 tab of Pepcid, but it didn’t appear to be helping much. He continued to throw up after his breakfast meal only, each morning and I took him to his vet on July 17. By this point he was very gassy and in discomfort. A full blood panel was run, along with thyroid/T4 and everything came back in the normal range. He was sent home on metronidazole and given something for his nausea as well. I monitored him closely over the weekend but he was getting worse rather than better and was throwing up after every meal on Saturday. On Sunday, I fed him boiled chicken and plain chicken baby food, which were the only things he was able to keep down. He was able to keep down some Wellness grain-free canned chicken on Monday too. He went without puking on Sunday and then threw up again on Monday evening. The diarrhea was back as well. He went back to his vet again on July 21 and had an ultrasound and x-rays done. Unfortunately, there was some visible scarring on his pancreas, although the rest of his organs appeared to be fine. Based on the results of the radiographs and his other symptoms, he was diagnosed with pancreatitis. I was really praying that raw food was the answer to Madison’s problems and that we’d be able to keep it under control with diet alone, but that’s no longer the case. He is now taking prednisolone: 5 mg for 4 days, then 2.5 mg for 4 days, then 2.5 mg every other day for another week. Then we’ll see where he’s at. Madison is extremely difficult to pill, but he’s been cooperative with the prednisolone pills so far. I’ve been able to hide the pill with just enough canned food to cover it, then put it on a plate with just a very small amount of canned food and gravy from the can, and he eats it without even realizing the pill is in there. I do this in the morning before he’s had breakfast and at night before his bedtime meal, and he’s too hungry to even care. Hopefully this continues to work because traditional pilling is incredibly stressful for both him and me. He’s had no vomiting since starting on the pred and his stool is firm again as well. His energy level is back to nearly 100%, his appetite is ravenous to put it mildly, and he’s been talking a blue streak. Luckily, his weight is still at 11.5 lbs which is where it’s been for about a year. He’s currently eating Wellness grain-free canned chicken this week, until his stomach is completely settled down. Then I plan to transition him back to raw, but I’m going to feed him Stella & Chewy’s chicken rather than Nature’s Variety. I suspect that the larger bone fragments and/or some of the herbs in the Nature’s Variety could be what set off his IBD flare-up, but there is no way of knowing for certain. He’s otherwise a strong and healthy 7 year old, so hopefully this is just a minor bump along the road. October 25, 2009: Madison stayed on prednisolone until October 2. His daily dose of 2.5 mg needed to be extended from the original plan. He was on that dose for about 4 weeks, then he took 2.5 mg every other day for an additional 7 weeks. During that time, I fed him Wellness canned chicken. He was vomit and diarrhea free for the entire duration. Despite being notoriously difficult in the past when it came to pilling, Madison was cooperative. I was able to hide his daily pill in his food and he never put up a fight with my system. He usually very excited to be fed, and when pilling him, I only put a very small amount of food on his plate. He was too happy to be eating to notice there was a tiny pill hidden inside his food. After getting him off the prednisolone, I noticed his stool was becoming slightly softer than what it should ideally be. He was also becoming a little gassy. After talking with his vet, I decided to try to put him back on raw food again. He threw up after his first meal of 1/2 canned Wellness chicken and 1/2 Stella and Chewy’s raw chicken. It was just like what happened right before he needed to go on prednisolone. Something about the Stella and Chewy’s just does not agree with Madison’s system. Every time I’ve tried to feed it to him, he has thrown it all up within 15 minutes. I decided to give Nature’s Variety raw chicken another try, because he was stable on it for about 7 months. He was on 1/2 Nature’s Variety raw chicken and 1/2 Wellness canned chicken for 3 weeks, but had two cases of vomiting during that time. Each time, the vomit consisted of yellow bile, some hair, and bits of bones. That’s exactly how things started last spring. For whatever reason, Madison isn’t able to handle the small bone fragments in the Nature’s Variety any longer. It could be due to the bones, the herbs, or complications from is pancreatitis. There’s no way of knowing for sure I suppose. So this week, on October 24, I’ve started transitioning Madison to canned EVO chicken & turkey. It’s too soon to know how that will work, but I’m hopeful. He at least likes the taste so far, so hopefully that continues! Attitude-wise, Madison is generally his happy, spunky self. He cuddles on my lap every night, plays with all his favorite toys, and keeps his little brother in line. He hasn’t lost any weight and is maintaining at around 11.5 lbs. He is dealing with some separation anxiety, because my work hours have changed this fall and I’m not home as often as I was over the summer. He has always had a habit of sucking on wool and fleece blankets while kneading on them. That habit has amplified while I’m gone. He finds blankets, pulls clothes out of the laundry basket, takes stuffed animals, and carries them across rooms of the house and up 2 flights of stairs. I don’t know how he even has the strength to do it! He has plenty of things to do while I’m gone, between his toys, watching the birds, boxes, cat trees, condos, etc. I’m working on some behavior modification techniques, so hopefully I can get that under control soon! February 15, 2010: Madison has had a pretty inconsistent past few months. He had normal stools for a few weeks in October on the Natures Variety raw chicken medallions, but was vomiting about two times per week. It was back to the drawing board for foods and I put him back on canned Wellness turkey. The vomiting subsided but the diarrhea and gas came back and he had to go on prednisolone again with a dosage of 2.5 mg per day (2.5 mg per day for 2 weeks, then 2.5 mg every other day for about 2 months). We tried weaning him off the steroids at the start of January until he started vomiting again mid-January, an average of once per week. Each time, the puke was yellowish in color with a small hairball. By the last week of January, he was on Forti-Flora, metronidazole for 5 days, and back on the prednisolone. We started at 2.5 mg once per day for 2.5 weeks, but then upped it to 2.5 mg twice per day. Additionally, he takes ¼ tab of Pepcid in the morning and at night and I’ve still been sprinkling the Forti-Flora on his food. He’d had a couple of more vomiting episodes and has had loose stool every day. During this time I’d tried unsuccessfully to find a canned food that doesn’t cause him to be gassy and have diarrhea. I tried Wellness Core chicken/turkey, EVO 95% chicken/turkey, EVO 95% duck, regular EVO chicken/turkey, and Natural Balance duck and green pea. He happily ate each one, but none of them helped with his diarrhea at all. It wasn’t as bad as he was when he was first diagnosed over a year ago, but it was getting there. Madison’s vet consulted with a few different vets about his case (Dr. Pierson who strongly supports a raw diet and has the www.catinfo.org website and Dr. Gaspar who is a feline specialist). Madison’s situation seems to be that when he’s on the Natures Variety raw chicken he vomits, and when he’s on canned he has diarrhea. We need to find the right balance between the raw and canned. It’s a possibility that the higher fat content of canned food is what’s causing the gas and diarrhea and possibly the bones in the raw food causing the vomit. It was recommended that we try rabbit as a protein source because it is lower in fat. To start with, I am trying Natures Variety raw rabbit medallions with canned Wellness turkey. I plan to add Natures Variety Instinct canned rabbit into the mix as well. As far as the vomiting goes, every time he’s vomited, it’s been when I’m not home. I feed him in the morning at about 6:30-7:00 and then not again until I get home at about 4:30-5:00. It’s that in-between time that he vomits, or overnight. I try to get home over my lunch break to feed him, but it’s not always possible. My suspicion is that he’s vomiting when he has an empty stomach and all the acids in his tummy are upsetting him. On top of all that, he gets all worked up when he’s hungry and still has some separation issues with dragging around stuffed animals or blankets when I’m gone. I’ve started giving him his Pepcid dose right before I leave the house in the morning as right before I go to bed at night. I started this the first week of February and he hasn’t thrown up since. On Saturday I fed Madison one NV raw rabbit medallion along with one can of Wellness Core chicken/turkey. He ate the same exact thing on Sunday and had a perfectly normal stool for the first time in months! He seems to love the taste and I’m thankful that he’s such a trooper with trying new foods. I can’t think of a single thing that he’s ever refused to eat. That certainly makes things a lot easier. I’m going to continue with gradually increasing the rabbit mixed with the canned Wellness until I get to half raw/half canned and see how that goes. After such an immediate improvement, I’m very hopeful that it continues to do the trick for him. June 22, 2010: Madison is currently eating 1/2 Nature’s Variety Raw rabbit medallions mixed with 1/2 Wellness canned turkey. He eats 2 medallions per day along with a half of a can of the Wellness turkey. He loves the blend and has a fantastic appetite. His weight is stable and from my home calculations, he’s maybe gained a few ounces over the past several months. He’s a bit of a piglet, and that’s okay with me. He prefers to be fed small meals throughout the day (morning, noon, afternoon, evening, bedtime) and when my schedule allows for it, that’s what I try to do. If a day ever comes when he doesn’t get excited about his food, I’ll know something is really wrong. He has been on 2.5 mg daily of prednisolone since winter and unfortunately all attempts of weening him off have resulted in him needing to be put back on. He’s been stable on it but whenever we work on tapering him, his vomiting increases. This spring, he’s has some problems with frequent hairballs, so that isn’t helping. I’m still working on finding the right balance between raw food and canned, along with the prednisolone. It seems that if the ratio of canned to raw increases about 50%, he has diarrhea. If the ratio of raw is higher than 50%, he vomits. At 50/50 without prednisolone, anything goes and he either has increased vomiting and/or diarrhea. My hope is that he can be completely off the medication by fall, but if he needs to remain on it to stay stable, then so be it. He’s very happy, relaxed, playful, and cuddly, so as long as he’s happy, I’m happy! October 27, 2010: Madison is currently doing well and has been remaining stable on 2.5 mg of presnisolone every other day. At the end of August, I tried to reduce him down to 1.25 mg every day with the hopes of getting him off the pred, but he had a small flare up. The timing was not good, as I’m a teacher and was going back to work after summer break around that time. It took him a couple of weeks to get used to my new schedule and with the help of the pred his flare up settled down. Occasionally, he will throw up, maybe twice a month. For the most part, his stools are normal. He’s a high strung boy though, so he has a bad day every so often. He still is eating a 50/50 mixture of Nature’s Variety raw rabbit and canned Wellness turkey and absolutely loves it. His appetite is fantastic, he’s sociable, loves to sit on laps, and it an all-around happy guy! For now, I’m still okay with him not being off the pred, because he’s happy, but that’s my eventual goal! with his vet to see if it might be time for a change. He may need to have an increase in his prednisolone dose as well to get things a little more stable. His yearly vet visit is coming up in the next couple of months, so I will know more then. Attitude wise, nothing has changed, so that’s good news! June 8, 2011: Another year has gone by and Madison will be celebrating his 10th birthday this week! Not much has changed since his last update. We did have a major scare last August and I was terrified I was going to lose him. It started with a case of bad diarrhea that quickly worsened into something I’ve never seen with Madison. The breaking point was when I watched him attempt to make it to the litter box and after getting part-way there, he just gave up and went on the floor. Madison is a very dignified cat and it broke my heart to see him in so much pain, and for it to all happen so quickly. I phoned the emergency vet clinic and they recommended bringing him in immediately. I probably wasn’t in much shape to drive, but we made it to the clinic and Madison was very withdrawn and feeling extremely sick. They ran some blood tests and got him on an IV for fluids right away. He needed to spend the night and as it turned out, he had contracted a case of giardia from my new puppy! The next morning, Madison was transferred from the emergency vet and spent the day there, getting more fluids and antibiotics. They knew he was feeling better and it was time for him to go home when he started to give all the vet techs a hard time. When he’s feeling well, Madison is known for being a tough customer and doesn’t hide his feelings when it comes to being poked and prodded! Madison made a very smooth recovery and by the next day, you wouldn’t have even known anything had been wrong. Due to nationwide shortages with rabbit meat, we had some issues with his food earlier this year. I briefly had to put him on a different brand of raw food, as I could only find Primal brand rabbit meat. I also tried mixing it with quail, but just one bite mixed with his regular food and that was it. Madison vomited within minutes. His stool is still not consistently as firm as I would like, so I tried some other combos of food. I’m able to find enough of his regular brand of raw rabbit, Nature’s Variety. His current mix is the rabbit, canned Wellness turkey, and Primal raw turkey. He continues to have some good days, some bad, with no patterns. He still vomits occasionally, more often in the spring than other times. I would like to stabilize him more by switching his food, but I’m currently at a loss on what to try next. He’s still taking 2.5 mg of prednisolone per day as well. On bad days I give him an additional 1.25 mg. He has become a major stinker with pills. I used to be able to hide it in his food, but he’s grown very suspicious and chews his food VERY carefully. If there’s a pill, no matter how small, he will find it and spit it out. I picked up a bag of Scripts brand Pill Pals that I’ve been using with great success for a few weeks now. Madison rarely ever gets treats anymore, so this is something very new for him and he gobbles the bite down without finding the pill. The treat has a very molded texture, like Play-doh, so I can hide his pill in a very small amount of treat. It has a small amount of wheat flour in it, but I’ve decided it’s a necessary evil to get him to take his pill. Forcing the pill into his mouth isn’t an option with Madison. He’s way too strong and I don’t want to fight with him! He is still has happy self. My new dog is a Golden Retriever mix named Parker, and he and Madison are fond of each other. They sleep on the bed with me each night and they’ll occasionally both lay on my lap as I watch TV too. Madison and Talon showed Parker who the bosses are right away, and Parker respects them. The kitties will yell at him once and awhile just as a reminder, and Parker immediately lays down. He’s very gentle with the kitties. Madison loves to walk beneath Parker and his long legs which is pretty cute. He also loves to ambush Parker and chase him around whenever Parker and I play fetch in the house. I don’t know if they’ll ever be best friends, but it’s safe to say they enjoy each others’ company! I would love to get Madison off the prednisolone, but I still don’t know if that’s in the cards for him. Right now, he’s happy and healthy, and that’s what’s important! October 18, 2012: Madison is doing well now. He had a definite down slide when all the chaos was going on, but he’s stabilized in the past few weeks. I increased the ratio of raw food in his mix and that is helping for sure. Now his special blend is 3/4 raw rabbit and 1/4 Wellness canned. His appetite is great and he looks like he’s maybe even putting on some more weight. It’s just really tough for him to pack on any extra pounds because his food is very lean and he doesn’t get treats. But the vet wasn’t concerned about his weight at all. He’s been very cooperative with taking his prednisolone pill again, which is always a relief and makes things much easier. I got some of the Greenies Pill Pockets that are meant for dogs, because they had a pea and duck flavor for dogs with allergies. He gobbles them right up! Hopefully things remain stable with him for awhile now. January 15, 2013: Madison is going to be giving cyanocobalamin B12 a try. I’m going in later this week for his first shot and the vet is going to show me how to do it so that I can give him shots myself at home. I’m a little bit nervous about doing this because it’s very difficult to medicate Madison unless it’s a pill hidden in food. I cannot imagine he will cooperate with getting poked with a needle. Madison has been having a flare up and we are upping his dosage of prednisolone from 2.5 mg per day to 5 per day. He’s also going on metronidazole for a little while to stabilize things. Hopefully all of this does the trick for him and gets him back on track. February 6, 2014: Madison has been doing quite well over the past year. He’s had some ups and downs, which is very typical for him, but for the most part, he’s been stable. He continues to be on prednisolone, at 5 mg per day. He gets half a tablet in the morning and the other half at night. I just recently have begun to taper him, rotating between 5 mg and 2.5 mg every other day. So far, he’s adjusting well and there has not been a noticeable difference. He will only eat his pill if it is wrapped inside of a bit of Greenies pill pockets, the pea and duck flavor, which is actually intended for dogs. But it’s just a small bit and the only way he’ll take it. His current weight hovers just under 11 lbs, which is fantastic for him. It’s nowhere near his former 14 lbs, but his food is so lean now that he just can’t put on much extra weight. He’s as hungry as ever, particularly in the mornings. To say he is talkative would be an understatement, and he is especially vocal in the mornings, insisting on several small means throughout the morning. He won’t eat much more than a teaspoon of food at a time, so many small meals throughout the day is the only route with him. Especially since if he walks away from his unfinished plate, his brother Talon will immediately swoop in and eat the rest. He loves his food, but is very picky about the consistency. I feed him a special blend consisting of Nature’s Variety frozen rabbit (approx 2 oz. ), 1/2 can of Wellness CORE turkey & duck (2.25 oz), plus about 4-6 little nuggets of Stella & Chewy’s dehydrated raw duck. I used to use a food processor to blend his food and make enough for about a week at a time and freeze it. But then Madison decided he no longer liked his food to be thawed from a frozen state and insisted upon a fresh blend each day. So now I hand mix each day’s food and he likes it very much. I’m willing to do whatever he wants if it gets him to eat! He has a history of terrible teeth, and needed to have a couple more removed this winter. This has caused some difficulties for him as the food gets stuck in his gums every time he eats. This causes him to make lots of smacking noises and paw at his face to get the food unstuck. I was hoping he’d be able to figure it out by now, but he still struggles. It seems more annoying to him than anything, but I just wish he didn’t have to deal with it all the time. I’m not sure what can be done though because he is so picky about the consistency of his food so it’s difficult to play around with the consistency to see if that makes a difference for him with his ability to keep it from getting stuck. I think one of the biggest reasons he’s improved has been the B12 shots. Amazingly, he is such a good boy when I give him his shots. It’s a nightmare to try to give him pills or liquid meds, but he doesn’t even flinch when I give him shots. He just purrs and purrs! I got a large bottle of B12 from the vet along with a supply of needles and I usually do a shot once a month or every few weeks. It was recommended by the vet to give .25 ml, but I usually do a bit more. That about covers how he’s been doing. He’s a very happy boy and other than being slender, you’d never guess that he has IBD. He’s over 11.5 years old now and has been living with IBD for more than half of his life. Hopefully things continue as they have been for quite a few more years, although I anticipate he’ll need to transition to another source of protein as he has been on rabbit for a few years now. But until then, I will just keep on doing what I have been! June 2015: In his last update, I mentioned he had needed some dental work done with some teeth needing to be pulled. This ended up being a bit of an ordeal. Losing those teeth caused his remaining teeth to fall against his gums and lips differently than they previously had. As a result, Madison ended up getting sores inside of his mouth that were very painful. They looked very similar to what a canker sore looks like in a person. His vet first attempted to solve the problem by going in and doing a biopsy of the sores to get a better idea of what they were. Fortunately, the sores were not malignant, but unfortunately, they returned about a month later. She tried combating the sores in different ways, including antibiotics, but nothing worked. Madison had a really hard time eating during this time, because each time he bit down on his food, his teeth would rub on the sores. He lost about .5 pound over the course of a two months. She ultimately determined the best approach was to go in and do surgery again, removing all of his remaining teeth from the canines back (which was only a few teeth). That seemed to solve the problem. His sores healed and he seemed much more comfortable with eating. Thankfully, his recovery was smooth and he kept his appetite up the whole time. It was very frightening to have him go through what ended up being 3 dental-related surgeries over a 3 month time period, but it was what seemed necessary. On a high note, he doesn’t have enough teeth left to cause dental problems, so it should be the last time he ever needs dental surgery. For food, I switched him to Rad Cat Turkey and he absolutely loves it. Basically, everything improved once switching him. His coat looks and feels great, he has more energy, his appetite is great, his stools are less frequent and firmer than they had been. Probably the biggest improvement is that he vomits less often. The bone fragments in the Natures Variety Raw that he had been eating were really bothering him and he had been vomiting bone fragments weekly. Rad Cat doesn’t contain any bone, so that problem was solved. He still vomits every week or so now, but only early in the morning on an empty stomach. Fortunately, our schedule allows us to be able to feed Madison many small meals throughout the day. His breakfast is broken down into about 3-4 servings, then he gets lunch at around noon, and then several more small meals from around 5:00 p.m. until 10:00 p.m. He’s just as talkative and demanding about being fed now as he ever was. He eats a total of 8 oz. of Rad Cat per day. He continues to take 5 mg. of prednisolone each day, in the evening. I had tried tapering, but things deteriorate whenever I do, so I have stuck with 5 mg. I have considered switching him to budesonide, but he hasn’t had any issues or negative side effects with the prednisolone, which he has been on for 6 years now. His weight is at 9 pounds 10 ounces. He never gained back the weight he lost after all his dental issues. He still gets B12 shots a couple of times a month and is doing well with them. He’s a teenager now, having turned 13 this past month. I do wish he could put on more weight, but at least it has been very stable for an entire year now. He’s happy, healthy, and still has plenty of cattitude. He’s always been a very feisty cat and I’m pretty sure that’s what has helped him to battle this terrible disease for so much of his life! Hopefully he has many more fighting years left to come! November 2016: There’s not much to report for changes to the management of Madison’s IBD. He continues to eat 7-8 ounces of Rad Cat Turkey and has been doing very well on it. He’s still on 5 mg of prednisolone daily, but I’m working on a tapering schedule. Right now, what seems to be working is 2 days of 5 mg, then 1 day of 2.5 mg, then back to 2 days of 5 mg. His stools are as normal as can be for him and vomiting only happens occasionally and only early in the morning on an empty stomach. His weight continues to hover right around 10 pounds. 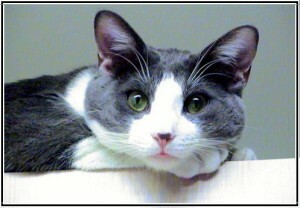 He had a couple of non-IBD issue in the past year, which fortunately did not lead to a flare-up. One involved him licking a bald spot onto his leg due to stress from me being out of town for work for 3 days. That healed up fine with antibiotics. The other issue that happened more recently was a tear to his cornea from getting bopped in the face by his brother’s claw. He was on eye drops for a few weeks and it’s healing well. He continues to be as neurotic as ever and very persistent about letting everyone know when he’s wanting (NEEDING) a snack. He gets many small meals throughout the day (usually about 8-10). Physically, he looks better than he has since being diagnosed with IBD. He has no side effects from the long-term prednisolone that we are aware of. He’s spunky, sassy, and playful. Things are going very well! August 31, 2017: No news is good news when it comes to Madison! He turned 15 this past June and nothing has changed in terms of his food or medication. His weight continues to be stable, currently just under 10 pounds. He’s still loving his RadCat turkey (6-7 ounces on most days) and is on 5 mg of prednisolone each day. My attempts to taper him haven’t been terribly successful, so it seems that 5 mg is just what his body needs to keep him stable. He had a full blood panel done this spring and all of his levels were in the normal range, with no negative side effects from long-term prednisolone use. He’s doing very well for a 15 year old cat! He continues to yell loudly to anyone and everyone who will feed him, has good energy, and has plenty of playful spurts! Plus he’s still got plenty of catitude! October 29, 2018: Madison turned 16 this past spring and continues to be stable and doing well. There haven’t been any changes to his diet or medication. He still takes 5 mg of prednisolone one time per day. His weight remains just under 10 pounds. His most recent round of bloodwork did show early signs of kidney disease, but our vet doesn’t feel it’s necessary to make any changes or additions to his treatment yet. He does still eat Rad Cat Turkey, so I’m most likely going to start making a homemade diet using EZ Complete and I’m hoping it will be a smooth transition, since Rad Cat is unfortunately no longer available. He moves a little slower than he used to, but that’s to be expected. He can still jump up onto the counter, get up and down the stairs, and occasionally play a game. We’ve gotten some motion lights to set up in the staircase to make things a bit easier for him, as his vision has started to decrease, especially at night. He’s got lots of comfortable and soft cat beds to choose from. He continues to wake up bright and early and sing for his breakfast and his appetite is great, especially in the mornings. I’m very thankful that he is still able to get around and be himself at 16!